The EDS-43 is an extremely energy efficient display system featuring a high brightness output contained in a sleek design. 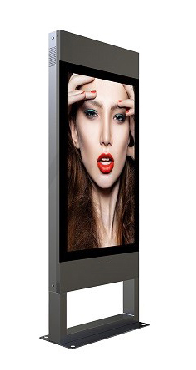 With a built in camera just above the 43″ display, this unit is ideal for applications such as shopping centres, hotels and restaurants. EDS-43 can be used as a Variable Message System to deliver traffic condition reports to road users and display real time freeway travel speeds and road safety messages. Using this content, road users can plan their journey to take the most efficient route home. VMS can act as a key element in dynamic traffic management by providing timely warnings of unusual traffic congestion, accidents, roadworks or other hazards that can affect journey time. EDS-43 also uses Parking and Guidance Information Systems (PGI), which provide drivers with active information on parking within controlled areas. Combining traffic monitoring, communication, processing and VMS technologies, it can provide information to drivers about vacant parking spaces by directing them to car parks where occupancy levels are low, which reduces their search time and traffic congestion. *** For tropical weather conditions with lot of rain & humidity we recommend using an IP65 EDS unit.